Playfully Contemporary: Rhinestone Kit Giveaway and Silhouette Design Team Blog Hop!!! I'm super excited for my post today! I get to highlight one of my favorite Silhouette products and also do a giveaway!!! We as the Silhouette Design Team are also doing a blog hop! So you can see what all of our favorites are and enter to win a lot of prizes!!! 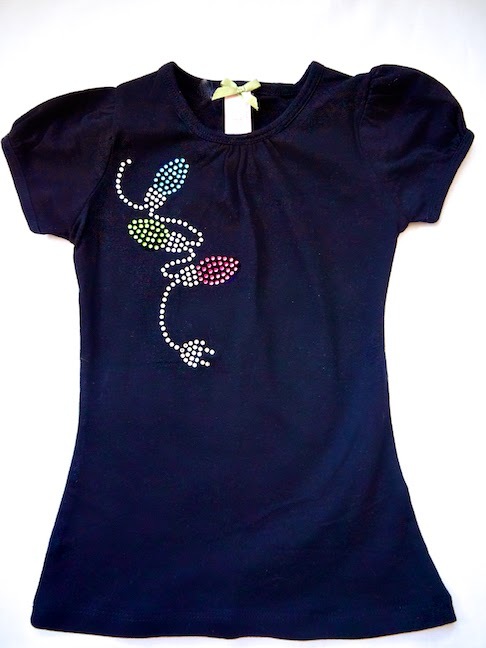 Ok, how cute is this rhinestone Christmas light design on this little T-shirt?! I like to make things for my daughter that not everyone else will be wearing. Using my Silhouette always helps me accomplish this. I know it may take a little bit of time to weed out the holes on the template velvet if you don't get it pulled off quickly, but this finished result is totally worth it! It may sound a little weird, but sometimes I enjoy weeding out my designs. It's just fun to see it come to life I guess. And yes...the shirt is way cuter on. I may also think that I have the cutest daughter in the whole world!!! Don't you just want to pinch those cheeks? 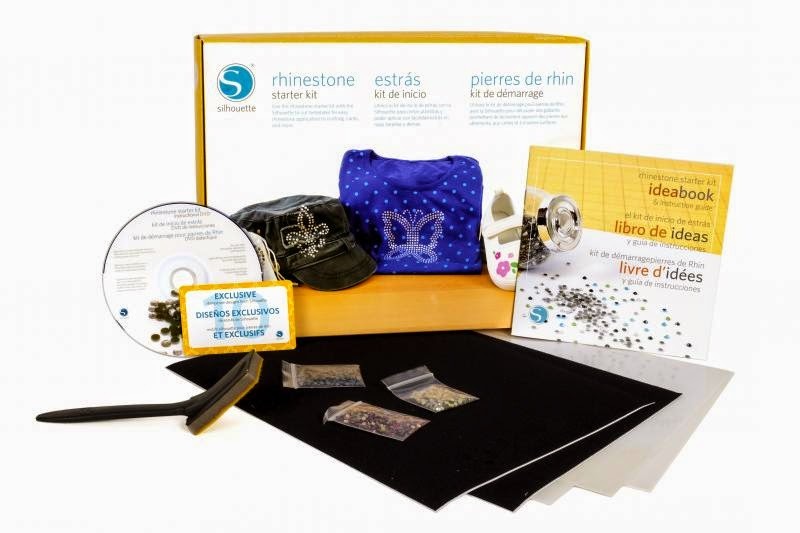 What would you make if you won this Rhinestone Starter Kit? I'd love to hear your ideas in the comments below! Enter here for a chance to win the Rhinestone Starter Kit! Yes, I want to win, and yes your little one is adorable! Awesome! Love love love this! this is one of the kits that is on my wish list!! your little one is a cutie pie!! What a gorgeous daughter! And a super cute tee! I have nieces and I would love to make unique tees and decorate little purses for them - it would be fun for me and I am sure they would love one of a kind designs. Your daughter is such a doll! I love how she is always ready for the camera. So cute! I need a little girl to craft super girly things for. I haven't tried the rhinestones yet, but this makes it look like fun! Love that shirt on your sweet little girl. I would make my 3 granddaughter a cute shirt too! I wish I could enter, but there are a couple of us in the world that don't use Instagram! Hard to believe, I know! I love the shirt, though! I have a few Santa Sacks that I would love to add a little bling to for my girls. I love being able to make things a little more girly for them to set them apart from my son's stuff. I'd like to make some tote bags for my sisters and I to use when we travel together. Some bling on them would be fun! I saw that file in the Silhouette store and I thought it was so cute and it is even cuter to see it on something like the top. Yes I would love to pinch those cheeks! Love the design and the rhinestones! However, I have never used rhinestones before--have only used the Outdoor Vinyl at this point. Is there a tutuorial ? Adorable, Amy! It is a really fun design for rhinestones!! So,so cute! I've not put rhinestones on anything before, but this is too adorable not to give it a try! Thanks for sharing. Pick them up and carry them her while they are little. Trust me, one day you WILL miss that. I would make my daughter and myself some holiday shirts! Definitely holiday shirts! I love your idea! That is so cute...I want to make one!! Cute shirt!! I would love to use rhinestones to add a little sparkle to tops, purses, wall hangings, etc., etc. The possibilities are endless! I have yet to try the rhinestones, and you have convinced me I need to add it to my wish list (the list is getting long). I would make an airplane tote! I think that's the best use of the rhinestones I've seen yet! So pretty. I think I might just have to make that adorable tshirt in big girl size for myself!! 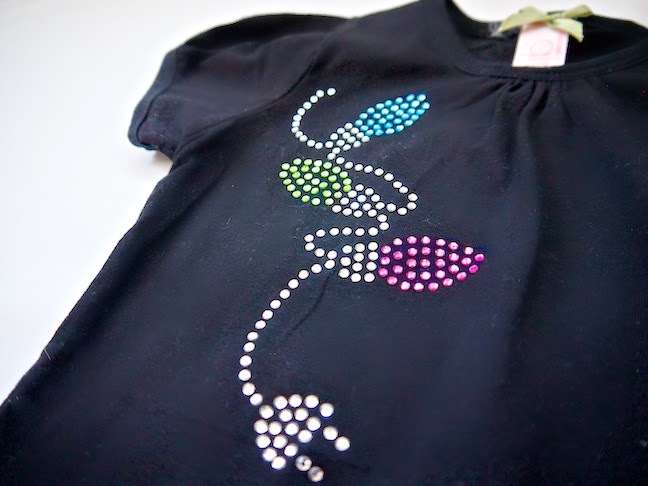 I would add some rhinestones to some of my daughter's tees - she loves anything that sparkles! I would like to add some rhinestones to my daughter's Converse shoes.. cute! Rhinestones capability is what I bought my Silhouette for the most! Unfortunately, I have not learned how to do it yet. This would be a great start! I've never worked with rhinestones before, but I'd love to make some shirts for my little girls. They look so fun! I have the kit but have been afraid to try, I guess I just need to jump in!!!!! I must confess that I first learned of the Silhouette by way of a demonstration make-n-take for rhinestones. I was so impressed I bought the Silhouette Cameo, but I have yet to get the rhinestone supplies to make anything. And I do love glitz. Thanks for your inspirational project and reminder that I truly do want to create with rhinestones. I guess I've just been off having other fun with the very versatile Silhouette, packed full of #CreativeGoodness. I would love to make some rhinestone clothes for my grandaughter. She loves the bling! I love the Silhouette but haven't done anything yet with rhinestones. I would love to make something cute for my niece! I haven't attempted anything with the rhinestones.....yet! would love to try a shirt like yours for a niece. I've seen it done on a hat before and i'd like to try that. Your daughter and your project are adorable! I have a feeling once I did one project I would be hooked! Thank you for sharing! I'd try some blingy pj's for my granddaughter! Would love to try this for niece. Love all the ideas I see. I would love the Cameo! I would like to try a t-shirt for my daughter or my niece or both!! I didn't realize it was just Instagram, I don't have it, too bad cause it would have been fun to win this kit. This would be fun to,do! I have neve used the rhinestones, but I really want to start. I think I would start by making a few dresses and t-shirts for my Goddaughter! I absolutely love that little shirt. I really need one in my size and a matching for my daughter. Cute tshirt!! I think I'd use rhinestones on some pillows. I have been wanting to try my hand at rhinestones. I want to bling out my camera strap and camera bag! I would totally make some cute little shirts for my daughter. She is sandwiched in by two brothers and could use a more girly touch to things! Just purchased my very first Silhouette and would love to try the Rhinestone kit! 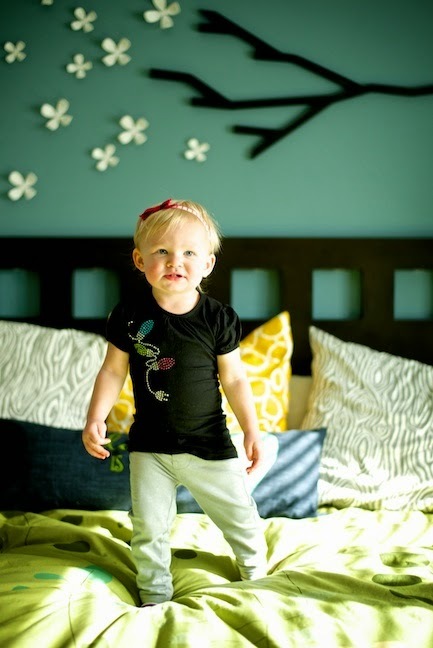 Your little one is so precious in that shirt! I love this rhinestone design, I have already picked it up! I would make a t shirt. I would make a raindrop design on a shirt. I would put something on my houndstooth Bible carrier! I'd love to try the jewel kit! That shirt design is adorable! I would love to learn how to use the Rhinestone template to create my own designs. Your daughter is a cutie! Will be getting a cameo for Christmas. Yay! I love the shirt you made. I' d probably do a shirt. Definitely a t-shirt! Love your t-shirt! I've never try making a t-shirt with rhinestone but now I want to get them. Thanks for the chance. I have done quite a few shirts with the rhinestones. I would love to try a pillow next. Love the shirt you made and your daughter is adorable. What wouldn't I make with rhinestones! I love everything that sparkles and I totally did not know you could do this with the silhouette!! Something "blingy" for my daughters! I got my Silhouette Cameo a year ago to make cupcake wrappers and toppers. I bought a rhinestone kit and love doing it so much and, as a graphic designer, starting creating my own designs. I'm now a contributing artist at Silhouette and am so pleased to see one of designs was chosen by Amy for her giveaway blog! Your model is beautiful. Thank you Amy for choosing one of my designs - it's great! Good luck to the winner! I love the seasonal t-shirts that have a simple rhinestone design, like a heart for Valentine's Day or a Jack-o'-lantern for Halloween. I'd try making one of those. I would make a "Band Mom" shirt!!! I haven't ventured into Rhinestone...looks awesome! I'd bling out some shirts for my nieces! Shirts for my daughter, valentines! Definitely a sparkly shirt... for me!! So sparkly and pretty! Cute! I would use this on a tote. I love me some bling! That same shirt but in adult size! I bought the file on Silhouette and can't wait to make one for myself & my daughter! I truly have been wanting to try out the rhinestones for so so long! This is an adorable shirt. I think I would make flying reindeer with white rhinestone belts and one with a red rhinestone nose for my boys. I would decorate a baseball cap to wear on bad hair days. :) Love your little top - very cute! A butterfly shirt for my niece. I would make some cute little sparkly purses for my nieces. super cute! I have a plain tee that I'd love to jazz up. Not sure what my to put on it yet though. Thank you. cute design & ADORABLE daughter! I would make my daughter a raccoon shirt out of rhinestones, it's her favorite animal! Thanks for the giveaway!